This chapter examines some of the challenges of unlearning anthropocentrism – i.e., the deep-seated cultural, psychological, and enacted prejudices of human specialness – in nature-based early childhood education programs. We begin with a critical exploration of recent trends in environmental philosophy and the conservation sciences that seek to move beyond the so-called archaic notions of “wilderness” and “nature” toward more managerial models of human dominion over planetary “ecosystem services.” We suggest the trouble with these discursive moves is that they shirk from the courageous conversations required from environmental education in a time of ecological emergency. 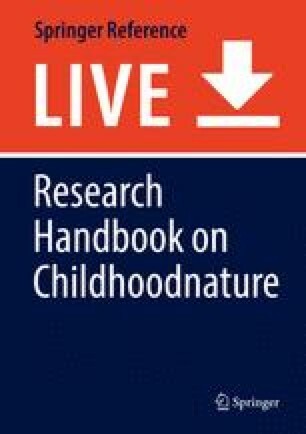 We conclude by drawing on research at nature-based schools in the Netherlands and Canada to illustrate the tenacity of anthropocentric “common sense” and suggest the beginnings of pedagogy of childhoodnatures guided by notions of rewilding and ecological humility. Gorski, P. C. (2009). Critical ties: The animal rights awakening of a social justice educator. Available online http://www.edchange.org/publications/animal-rights-social-justice.pdf. Kolbert, E. (2012). Recall of the wild. New Yorker. Accessed 12 Mar 2016. http://www.newyorker.com/magazine/2012/12/24/recall-of-the-wild. Taylor, B. (2016). The value of a gorilla vs. a human. http://www.huffingtonpost.com/bron-taylor/the-value-of-a-gorilla_b_10214928.html. UNEP, & UNESCO. (1976). Belgrade charter. www.medies.net/_uploaded_files/TheBelgradeCharter.pdf.